Palo Alto Research Center (PARC), working with SPX Cooling Technologies, is developing a low-cost, passive radiative cooling panel for supplemental dry cooling at power plants. PARC's envisioned end product is a cooling module, consisting of multiple radiative cooling panels tiled over large, enclosed water channels that carry water from an initial cooling system, such as a dry-cooling tower. The cooling panel consists of a two-layer structure in which a reflective film sits atop a unique metamaterial-based emitter. In this architecture, the top layer completely reflects sunlight while the bottom layer effectively emits infrared radiation through a spectral window in the earth's atmosphere. 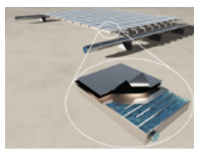 This combination enables radiative cooling of the water even in full illumination by the sun. The cooling panel will be made using a lithography-free process compatible with roll-to-roll fabrication. In a large-scale system, the water temperature at the outlet of the cooling module is expected to be 8oC cooler than the temperature of the water at the inlet, which will result in a 3% efficiency gain for the power plant. If successful, PARC will develop a low-cost, low-complexity, and scalable structure that can cool water to near-ambient temperatures. PARC's structure could help power plants maintain energy efficiency by providing a low-cost means of supplemental dry cooling when water use is restricted. The team's system could reduce water usage for cooling by 30%, which helps conserve water for other uses. By applying low-cost and scalable manufacturing techniques, PARC estimates the system could be an economical option for radiative cooling.